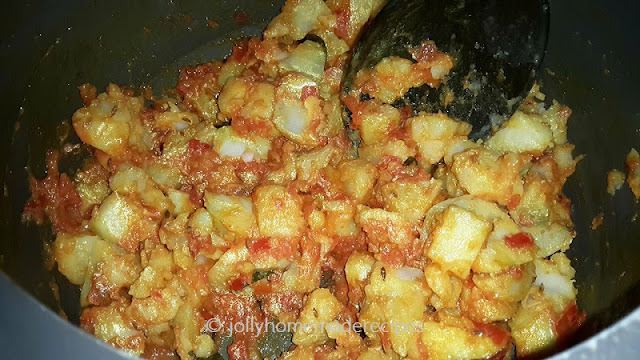 How to make Aloo Rasedar with step by step photos recipe - This is one of the easiest and simple potato curry recipe which is made with boiled potatoes, tomato and few herbs & spices. 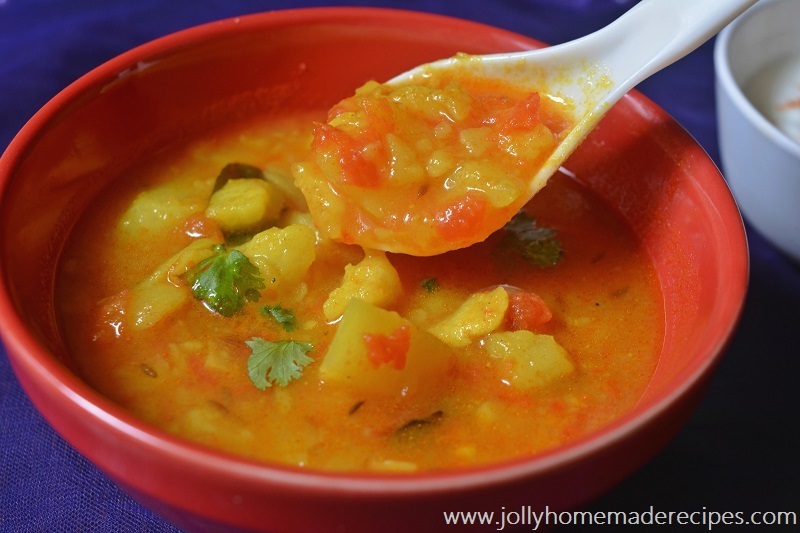 "Aloo Rasedar "- aloo means potatoes and rasedar means a gravy/curry which is thick or thin in consistency, but this dish looks good when it is thick in consistency. This curry recipe is again another dish is adapted from my mother's kitchen, I must say my mom is a superb chef <3 <3 and her recipes are so simple and very delicious. 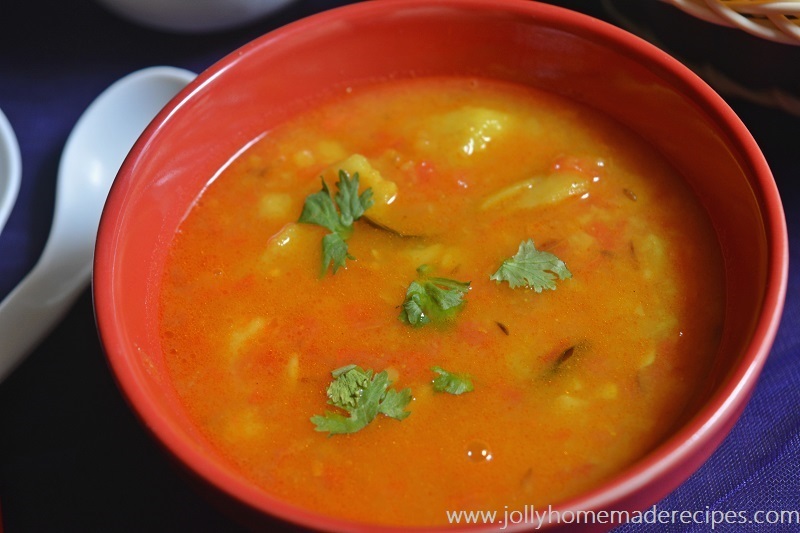 You can also made this curry during your fasting times since this is a No Onion No Garlic recipe. I added curry leaves into curry, which gives fragrance and taste to the dish. This dish is good going with all type of Indian bread either paratha or even simple roti also or ajwain poori or kachori. This is not traditional aloo-rasedar variety because everyone prepare it their own variation, this is simply north-indian mixed with punjabi version style of potato curry. This is one our all time family favorite veggie because it is easy and simple to make. 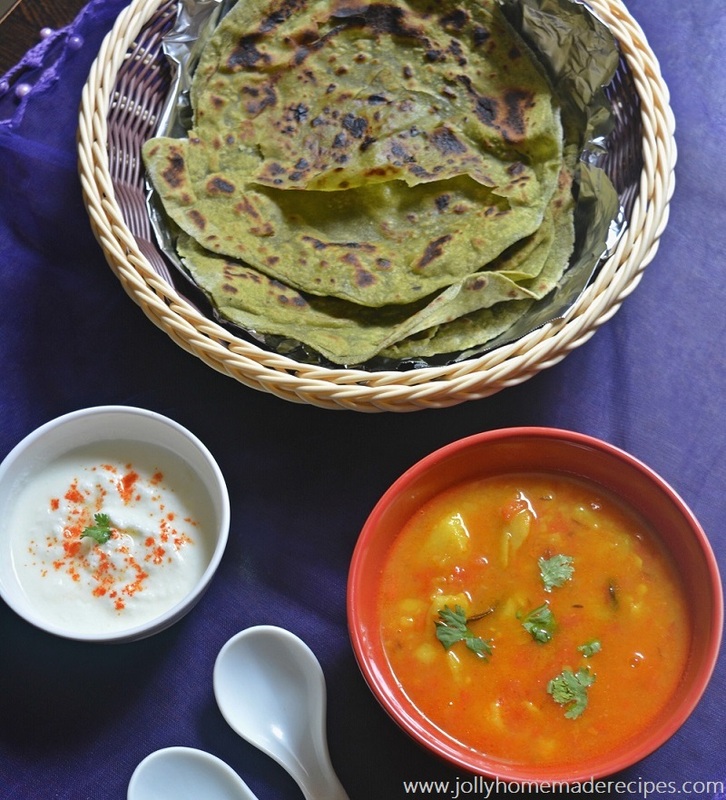 With just few ingredients you can prepare this curry and can prepare once in a week or sometimes this is our weekend lunch with poori, my husband really enjoyed this with paratha or poori. 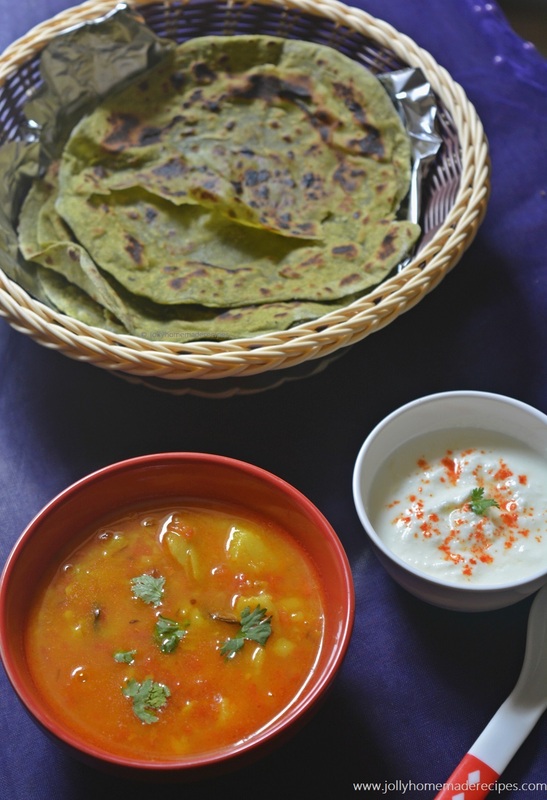 When I was not in mood to prepare any regular veggie, I usually made this aloo rasedar with palak paratha or methi paratha. Aloo or Potato is one of the veggie which is liked by most of the people & I loved potatoes very much..hehehe, you can even make varieties of aloo dish either dry or curry one with your favorite Indian bread. The common breakfast nowadays which is famous all over India is Aloo-Poori. 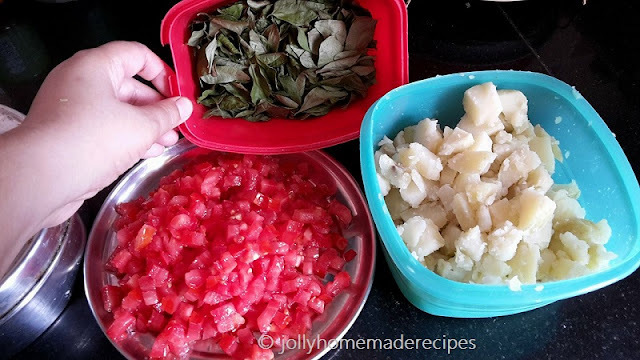 You can even make this curry during navratri fasting times also, for that you need to add sendha namak as compare to normal salt, or use spices according to which you used during navratre times. At my home we didn't used garam masala or turmeric powder during navratre fasting, so we can avoid it make same curry with poori. 1. First boil the potatoes, peel the boiled potatoes and cut into cubes and mashed the boiled potatoes. 2. Heat oil in a pan or cooker, add cumin seeds stir till it gives you nice fragrance of jeera, add finely chopped tomatoes into it. 3. Add all spices - salt to taste, coriander powder, red chilli powder, turmeric powder, pinch of hing and mix well. 4. 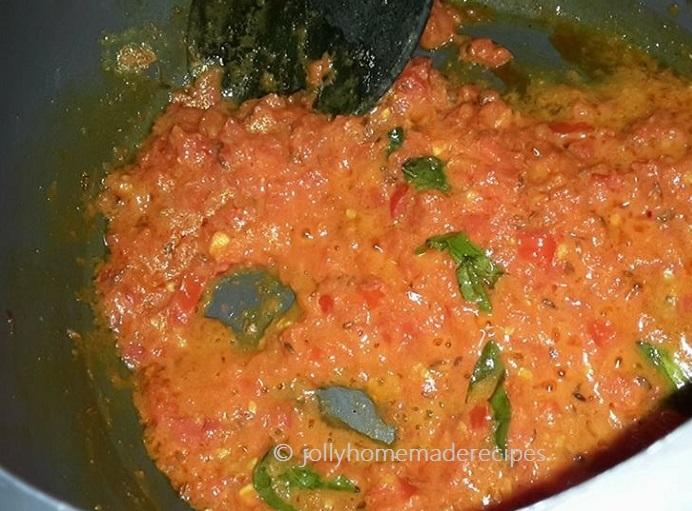 Now add curry leaves, stir well and saute the tomatoes till they soften and you see oil releasing from the sides. 5. Add the crumbled potatoes and stir well. Saute for a minute. Add 1 to 1.5 cups water and stir again, you can adjust the consistency as you want by adding less or more of water. 6. Check your seasoning, bring the potato curry to a simmer for 10 to 12 minutes to thicken the curry slightly, you can also mash a few potatoes with the back of a spoon, you can keep the consistency you want. 7. Lastly add chopped coriander leaves and garam masala powder. Stir well. 8. Serve aloo rasedar with pooris or roti's or parathas or you can also garnish with some chopped coriander leaves while serving. One of my favorite. Love your version. Looks so delicious dear! This is one of my favorite comfort food. 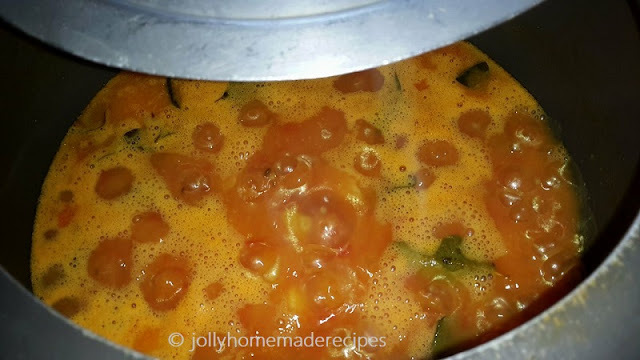 Very much loved your recipe and beautiful stepwise images with this post. Excellent share. I love this recipe of yours.Fab share. Awesome and very tempting..nice share.. 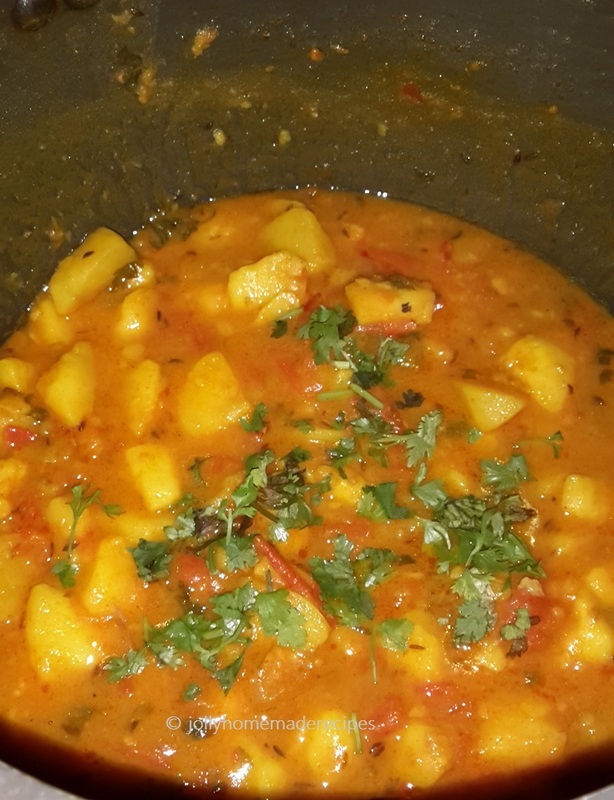 I Just posted this almost same version of Rasa Batata with poori. Urs looks delicious and comforting. really a delicious homely dish. I lovee this curry with pooris. Tastes awesome. 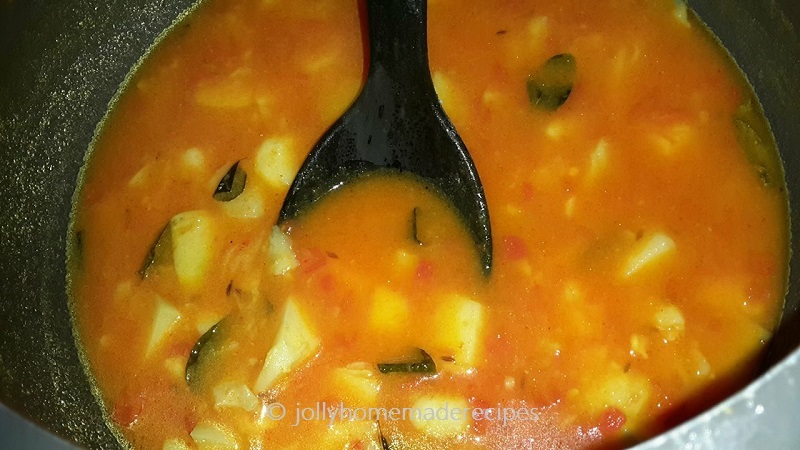 Yummy recipe been ages since i made aloo. One of my favourite potato curry. Perfect with kachori or puri. Looks so inviting. Lovely share. For ever satisfying alooo, in the yummiest form. 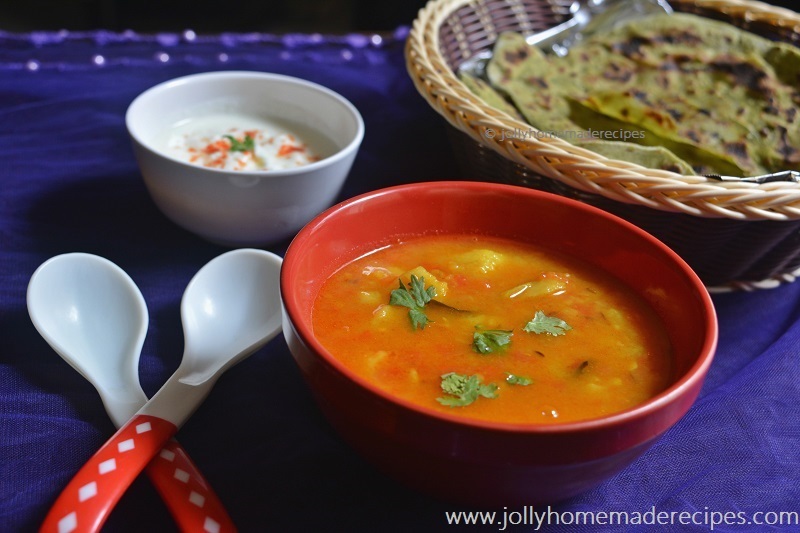 Love this simple aloo curry...perfect to dunk in the parathas...YuMMM!! This is one my favorites to enjoy with puris on a lazy Sunday morning! Your version looks delicious! Curry with mashed potatoes - that's awesome! No onion and garlic means less peeling and chopping. I'm already in love with this curry. Like you mentioned, it is one the easiest recipes to cook when time is short but I could happily eat this every single day, though I shouldn't. Simple flavours and I actually love the no onion garlic version of this, the one you make for fasts much more. Lovely meal there. Oh i love this curry :) Yummy and easy to prepare !! This is one such curry that can be had any time and is everybody's favorite too. This looks fabulous..the picture of roti dipping in the gravy is tempting. 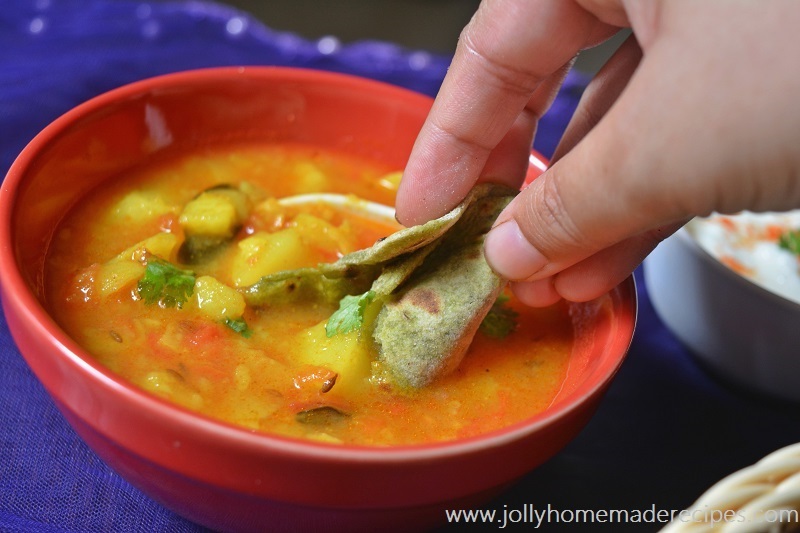 Whenever I am out of veggies or any option I love to make rasa aloo. 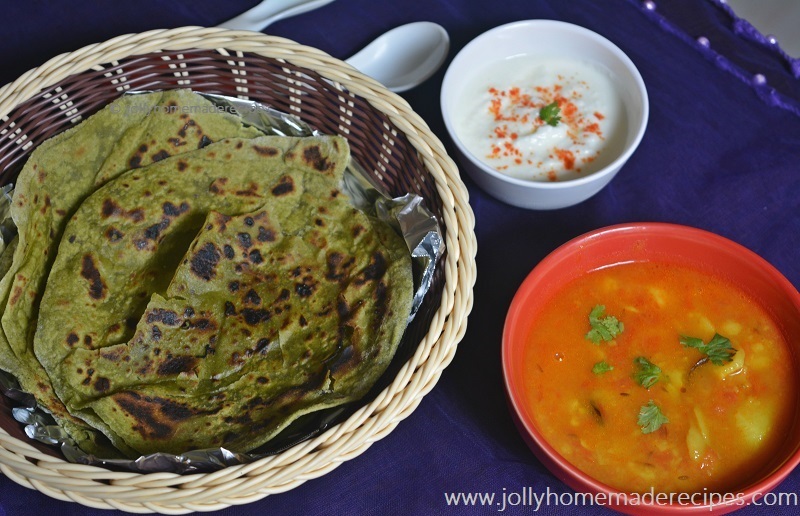 Goes so well with poori and paratha.Looks absolutely delicious Jolly. I love aloo. This one looks scrumptious!! Loved the detailed explanation.